In my opinion writing novels is in a way telling a story. For that purpose it is necessary the help of several elements: characters, time, construction, focus, style. As I see it, with this elements we can create as many experiences as we like… all the experiences, except destroying them, if we did then we would be destroying the novel. There is a wide range of experimenting possibilities, with only one limit: that something has to be found. Miguel Delibes, en César Alonso de los Ríos, Conversaciones con Miguel Delibes. Madrid, Magisterio Español, 1971, p. 143. I give my characters an outstandig position above all the elements that are combined in a novel. Characters that truly become alive make the arquitechture of the novel be in a secondary position, they make of the style a vehicle which existence becomes merely an anecdote and they can make realistic the craziest plot. Miguel Delibes: Un año de mi vida. Barcelona, Destino, 1972, p. 213. I transfer to my characters all the issues and distress that hassels me, or I show the thoroughout their mouths. This is, if the author is sincere, he or she reflects him/herself in them. Miguel Delibes, en César Alonso de los Ríos, Conversaciones con Miguel Delibes. Madrid, Magisterio Español, 1971, p. 58. F rom my point of view an authentic novelist nourishes from the observation and from inventions as much as he nourishes from himself. The authentic novelist has in him not only one but hundreds of characters. Hence the first thing a novelist should do is to observe his own interior. In this sense all novels and all the main characters of a novel have inside of them a lot of the author´s life. Living means a constanct choice between several alternatives. But when it comes to face the blank papers, the novelist must have the skill to direct his own life towars a different destination that perhaps he previously rejected. This means that the novelist can imaginary recreate himself. So, we can conclude that above the novelist skills of inventing or observing, he must have the skill of splitting himself: I am not this way, but I could be this way. In other word he has to be able to give testimony not only about what it really happened, but about what it could have happened in each possible case and situation. 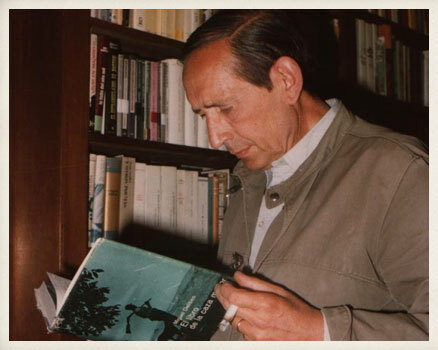 Miguel Delibes: Un año de mi vida. Barcelona, Destino, 1972, pp. 92-93. For me the hardest task of a novelist comes before the creation part, before he starts to créate literatura itself, this means, when he has to plan the topic of the book and try to find a way to develop it and resolve it. Miguel Delibes, en César Alonso de los Ríos: Conversaciones con Miguel Delibes. Madrid, Magisterio Español, 1971, p. 132. Each novel requires a different style and a different technique. You cannot tell the story of the problems of a folk that lives in agony (Las Ratas) in the same way you tell the story of a man ditressed by mediocrity (Cinco horas con Mario). The first task of a novelist, once he choses the topic of the novel, is to find the correct formula to tell the story and the second task to find the appropriate pace […] Whenever those problems are solved, the creation temperature-that some called muse and some other inspiration- cannot be denied. In that precise moment the tools of the novelist to eliminate unimportant details play a big role. By this I mean that once you are in possession of the formula (technique) and you got the right pace (style), the difficult thing is not to write a long novel, but to say what we inted in the shortest number of words possible. Miguel Delibes: Un año de mi vida. Barcelona, Destino, 1972, pp. 97-98. The novel cannot remain anchored in its same old purpose of entertaining the upper-middle class, but I think that there is more interest in deep innovation than in formal experiments. Nowadays, the novel, more than entertaining – we already have commercial films and the television for that purpose- it should disturb, disquiet. The novel is perhaps the most direct instrument we have to drill that arrogant certainty of a self satisfied upper-middle class. Miguel Delibes: Un año de mi vida. Barcelona, Destino, 1972, p. 134. Miguel Delibes: Un año de mi vida. Barcelona, Destino, 1972, p. 99. Delives conception of the novel is based on a total rejection of innovation just for the sake of it. It is also based on a strong support of the narrative that refers to a story. That theory was formulated by Delibes himself in various occasions and it focuses both in the form but also in the content to explain that form can only occur if content is appropriate, and viceversa. 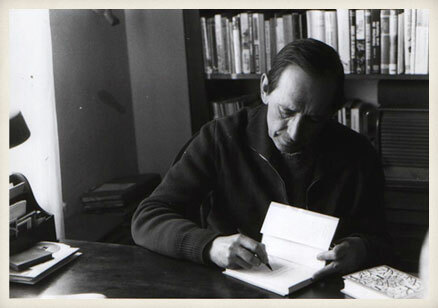 In his own words: “I have to praise any form of the novel as long as we take into account that the form, regardless what form it is, has to be necessarily filled with something”, “The most important thing in a novel is what is being told, how it is told, could never crate a great novel, even I would dare to say, that could not even create a novel”. Delibes therefore, strongly support a type of novel that contains events. The readers keep on asking for a character, a landscape and a passion. Santos Sanz Villanueva: “Hora actual de Miguel Delibes”, en Miguel Delibes. El escritor, la obra y el lector. Barcelona, Anthropos, 1992, p. 85. Miguel Delibes Miguel Delives is a novelist in the sense of Proust, Tolstoi… He takes more interest in social psychology than in social structures. For this reason he is so important for me not only as a reader but also as a historian. The novels of Delibes are a rich and endless source of historical documentation to reconstruct the recent past of this country. In particular the post-war period and all related to the upper-middle class of the provinces. I´m not underestimating the importance of the sources that we have as historians, but estatistics, for instance, are only the skeleton, a scaffolding. A historian has to add sking to those bones and for that purpose there is nothing better than the support of a novel. Cinco horas con Mario, Mi idolatrado hijo Sisí, only to mention some titles, reflect better than any aseptic report, the province post-war life in Spain. The authentic History is found in how people used to live, not in figure. Delibes openly shows, with his irony-making a good use of Literature, that is for sure- the moral schizophrenia and the snob and fake attitude of the early upper-middle class during Franco´s regime. Raymond Carr: “La sociedad española de posguerra en la novelística de Miguel Delibes”, en El autor y su obra: Miguel Delibes. Actas de El Escorial. Madrid, Universidad Complutense, 1993, p. 69. 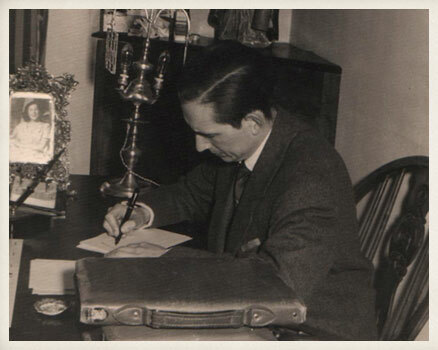 Apart from his amazing command of the language and his extraordinary narrarive skills based on a highly polished and more and more brief technique, the greatest and more decisive contribution of the novelist MiguelDelibes to the contemporary scene of the Spanish language arts is to have incorporated an authentic view of the daily life of the villages and towns of Castilla to the Literature. 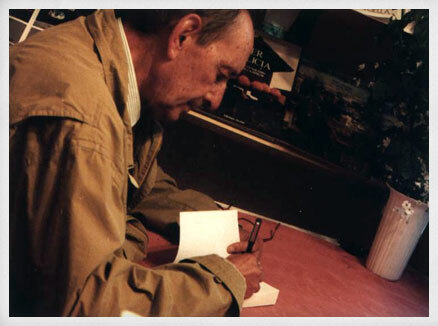 Miguel Delibes signing copies of his books. Book Fair of Madrid, 1990. Antoni Vilanova, en Antonio Corral Castanedo: Retrato de Miguel Delibes. Madrid, Círculo de Lectores, 1995, p. 95. In my novels, I eagerly try to cover the totality of the region where I was born and raised and where I live, so I couldn´t dismiss any of its landscape expressions and thus in El Camino I pay tribute to the Mountain, Iguña Valley, where my family roots are, in las Ratas, La hoja roja, Diario de un cazador, La mortaja and Viejas historias de Castilla la vieja, I portray the vast inmensity of the fields in Valladolid, Palencia and Zamora, to the North of the river Duero; and finally in Las guerras de nuestros antepasados, el disputado voto del señor Cayo, Parábola del naúfrago, Aventuras y deventuras de un cazador a rabo and Mis amigas las truchas, there are a great variety of descriptions of the abrupt intermediate region of the north of León, Burgos, Palencia and Soria, perhaps those are the regions in Castilla that are less considered in Literature, although those regions are not less besutiful. Those regions shor great heights and peculiar vegetation that introduce the Northen lands combining with extreme wheather conditons and the deep blue sky so tipical of Castilla. Miguel Delibes: Castilla, lo castellano y los castellanos. Madrid, Espasa Calpe, 1995, p. 26. The narrative technique of Migule Delibes is of a high plasticity: throughout the words “you can see”, you can feel the human characters and the atmosphere. Eduardo Haro Tecglen, El País 28. 11. 1979. In my novels and short essays about Castilla I only intend to be precise and to the point. Those who accuse me of having an excess of literature in my novels are wrong, and they rarely have visited the villages of Castilla. Reading Garrigues has led me to a rather accuracy tendency which becomes more noticeable when I started dealing with the inhabitants of Castilla. This is, the precision with which they address their problems or the fact that the lay of the land that sorrounds them is quite unusual, peculiar. This rural language- that has nothing to do with popular language- still keeps on catching my attention. When I write in my books “cabezo” or “cotarro”, they don´t mean the same. These kind of things are known by people from the villages but perhaps not by people from the cities. The Cotarro, teso, cueto, are not cabezo. The cabezo is simply the cueto, cotarro, the hill that presents a mount crest of holm oak trees. This language could seem picky, but this is accuracy. Miguel Delibes, en César Alonso de los Ríos: Conversaciones con Miguel Delibes. Madrid, Magisterio Español, 1971, pp. 183-185. The most characteristic feature about Delibes, the thing that best reveals his narrative is his way to take into the novels the point of view, the creation from inside of a principles system and beliefs of his characters. In other words, Delibes constructs character novels, his way […] The originality of Delibes leans on placing his characters in the center of his novels […] Many of Delibes´characters are normal and modest people whose lives don´t experience anything worth being told. Mochuelo goes to school, Nini prowls around in his village, Lorenzo gets married and goes away, Carmen does the household chores, Quico gets bored. What is being told are the combination of daily routines which lack epic importance […] The greatest temerity of Delibes is to make worth telling in an artistic way what is consider unimportant, and this means making a novel spin around a simple character to whom nothing intereting happens […] An essential aspect to understand the mos characteristic novels of Delibes is the perspective from which they are told. The narration in first person arises from the need of the main character to tell what happens and to show his/her vision of the world […] The same pattern is followed in those novels in which a simulation of first person narration exists as in El camino, Las ratas or El príncipe destronado, in these novels there is not apparently a main character able to support the weight of the narration, for this reason a narrator in third person is necessary to cover up. So, then we know how the miracle of language happens in these novels: the language of the narrator is leaked through the language of the characters, and the characters end up imposing their vision of the universe […] In Delibes´novels happens that perspective is one of the ingredients of reality. Alfonso Rey: La originalidad novelística de Miguel Delibes. Universidad de Santiago de Compostela, 1975, pp. 259-275.
dropcap style=”book”]T[/dropcap]his reflection about the linguistic porosity of Miguel Delibes takes us in a very unexpected way to the key of his novelistic formula, or at least what for me is: an extraordinary way to “give voices to characters”. Delibes can create the voice of a village child, the voice of a rude housemaid, the voice of a snob young girls of the capital, the voice of a hick a redneckof Castilla with such an efficiency that becomes his greatest virtue when he creates novels. This talent of “giving voices” is not not only about reproducing exactly the voices of folklore, but also is about having the capacity of giving the narrator of his novel a “neutral voice”, but with a slow witted saying tone that matches very well with with all his charactes in general but not having a special attachment to any of them. […] Delibes does not intend to fill his novels with popular voices or dialogues, for this reason he also speaks like another of his characters in the novels. 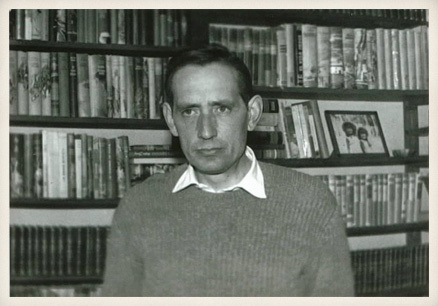 Francisco Umbral: Miguel Delibes. Madrid, Epesa, 1970, p. 63. If pity gives the entire work of Miguel Delibes an ethic density that is constanct, his art could be defined essentially as rhythm: catching the human melody in repetition and variation. Every novel or narrative work that is considered to be poetic in itself and merely informative, has a rhythm that can be noticed at all levels: sentences, characters, events or situations, expansive symbols, interwoven topics. But there are novels and tales that dissolve or soften the rhythm, and other make it harder or more tense. Delibes´ narration belongs to the second group: words are repeated, sentences, features, situations, motifs, images focused on highlighting some symbols that give the special tone to the text and make wider the meanings, also some topic aspects are repeated to create a whole full of intentions. Gonzalo Sobejano: Prólogo a La mortaja. Madrid, Cátedra, 1987, pp. 44-45. The best novels of Miguel Delibes exhale an almost painful brithness in which the beauty of the natural world and dispair of the innocent are very frequently desecrated by fatality that chases those who doesn´t have anuthing, by brutality of the strong, by the changing of times that drags everything the good and the bad[…]. 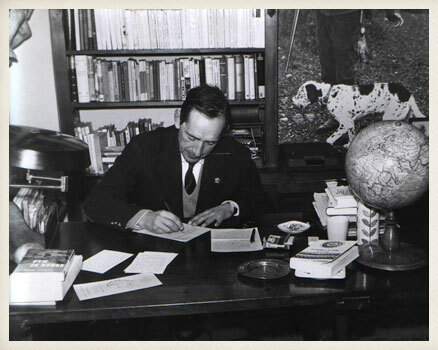 What we find in the great novels of Miguel Delibes is not of costumes and manners but careful observation of the human lifes and the jobs and the dreams of ordinary people; he pays equal attention to the names of things and animals and plants as for the speaking details […]. Perhaps there is nothing more difficult for a novelist than the task of looking at the world with the eyes of a novel character and so leaving aside his own voice and transcribe to the text a different voice to his. In the contemporary Spanish novel there aren´t more truthfull looks or voices than those of the creatures invented by Delibes: a boy scared of feeling the adulthood so near, a poor housemaid, an institute janitor keen on hunting, a mentally retarded man, an old man that sees how the end of his life comes nearer, a province wife who lives in anger. In Los Santos Inocentes, the story, the language, the point of view, the depth of the consciousness they all melt and transform in only one narrative stream only interrupted by the rhythm and poetry written in prose.